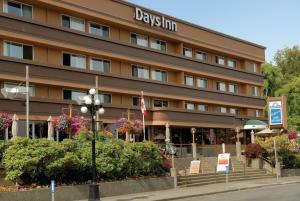 The Days Inn – Victoria on the Harbour is an AAA/CAA and Canada Select approved Hotel. It is perfectly located in the heart of Victoria, along the breathtaking Inner Harbour. The Hotel is within walking distance of the Royal BC Museum, Convention Centre, Parliament Buildings, and IMAX Theater. The world famous Butchart Gardens is only a tour bus or short drive away. We are directly across from both US ferry docks, the foot-passenger Clipper ferry and the car/passenger COHO ferry, for convenient year-round travel. Only a short walk to places like Beacon Hill Park for the kids, pets or just to soak in the scenery. If you walk outside our doors there are shops on every corner and plenty of places to dine. The lobby is bright with all the staff cheerfully greeting our guests, ready to help in any way, whether it is checking in, checking out, or setting up tours and dinner arrangements. Our rooms have all the modern conveniences, including in-room coffee/tea and some have harbour views and kitchenettes. Downstairs in our lobby we have our terrific Swiftsure Restaurant and Lounge, with an outdoor harbour-view patio in the summer. Our seasonal outdoor pool and year-round whirlpool is here for your pleasure, relaxation and to keep the kids entertained. Victoria is also becoming known for its Whale Watching Adventure tours which can be arranged by the wonderful Front Desk staff at the hotel. Or if you want to see the city in a unique and fun way, try the horse-drawn carriage rides. Let us make any arrangements you may require including City tours, reservations for dining or car rentals. Come and enjoy our beautiful Garden City and we will take care of the rest. Room with one bed can accommodate up to 3 people and room with two beds can accommodate up to 5 people with a request of a cot, please request cot upon arrival at 10 CND plus tax per night. Cots are available on a request basis, we cannot guarantee availability. Pets allowed – 15 CAD per night.